Ruth’s Chris menu prices at your fingertips. Ruth’s Chris Steakhouse is an American upscale steakhouse serving classic dishes skillfully prepared using the freshest ingredients. Ruth’s Chris Steak House specializes in serving superior cuts of custom-aged USDA Prime Midwestern beef seared to perfection using a legendary searing technique. Guests can also choose from several chicken, fish or seafood entrée dishes. Perfectly cooked steaks and fresh seafood are paired with an extensive selection of the finest wines chosen from an award-winning wine list. No meal is complete without a delectable dessert. Ruth’s Chris offers several dessert dishes including their famous crème brûlée. Below are the latest Ruth’s Chris Steakhouse menu prices. What’s new at Ruth’s Chris Steakhouse? Need a place to socialize with your co-workers. Head over to Ruth’s Chris and enjoy their Sizzle, Swizzle, & Swirl Happy Hour menu. Select food and drink items to get the socializing started. Reservations are not required but recommended especially during peak dinner hours and special occasions. For those guests that want to make a reservation, Ruth’s Chris offers a convenient online reservation feature on their website. Guests can also contact the restaurant location directly. If you are planning a social event or corporate meeting and are looking for private dining rooms, Ruth’s Chris can help. A prime steakhouse experience that couples great food with impeccable table service. Ruth’s Chris also offers off-site food catering services where everything you expect from dining at the restaurant is handled and taken care of at the location of your choice. Ruth’s Chris does have a selection of gluten-free menu options. The menu items are either prepared as gluten-free or modified during preparation o be gluten-free. The Ruth’s Chris Steak House kitchen is not gluten-free. Vegetarian menu options are also available. Items could be a specialty vegetarian entrée or a vegetarian side dish. Guests with dietary restrictions or allergies should always contact the restaurant before visiting and advise the restaurant manager of any food-related concerns. For guests that want to be the first to know, they can sign up to receive regular emails for Ruth’s Chris. Guest will get updates with regards to new seasonal menu items, an invitation to exclusive events, promotional offers and more. Signing up is simple and free. Guests can visit the official Ruth’s Chris website to sign up. Ruth’s Chris Steak House is always looking for team members that are passionate about delivering outstanding service and great food to guests. Interested candidates should visit the Career page on the official Ruth’s Chris Steak House website to learn more about the company, its values, and browse the list of current openings. In 1965, Ruth Fertel purchased the Chris Steak House located in New Orleans as a way to earn money to send her two sons to college. In 1976, after a fire destroyed the building, Ruth relocated the restaurant and renamed it Ruth’s Chris Steak House. In 1999, after falling ill with lung cancer, Ruth Fertel sold a majority interest to Madison Dearborn Partners. 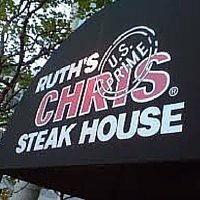 In 2005, Ruth’s Chris Steak House became a publicly traded company. Today, there are over 140 Ruth’s Chris Steak House locations. Ruth’s Chris Steak House is part of Ruth’s Hospitality Group and is headquartered in Winter Park, Florida. Guests can follow and connect with Ruth’s Chris Steak House via Twitter and Facebook. For more information about Ruth’s Chris Steakhouse, visit their official website. Always good. Worth the extra $$$. The filet mignon was great and cooked perfecto! 2nd time in a row (our last two visits). We have eaten here over 50 times, taking our two children, friends and parties of six or more, BUT these last two times, much disappointment (it took over a year till yesterday to return for our final visit). My wife ordered the $43.95 special, but I wanted ala carte because I Love their spicy lobster with cucumber salad and again I ordered two just for me. Then I got a spinach salad and a petite ribeye. We both ordered iced teas. When the bill came, I instructed my wife to use the American Express card with a 20 per cent tip. Our previous visit, last July 2014 celebrating our 45th wedding date we ordered onion rings. When they arrived, they did not look very good and on first bite we stopped eating them and called over the waiter as they were dripping with oil. He consulted with his manager and NOTHING was done. Back to yesterday; I had trouble sleeping because on the check (for the meals) I noticed a charge of $54.95. This morning, on the computer I was attempting to check prices for there, but no recent ones were found other than $43.95 and $54.95. Aubrey, our waiter was suggesting different foods and caught my ear at the spinach salad, even though I could not locate it on the menu, I wanted that. Well, as I surmised after looking, Aubrey gave each of us the specials EXCEPT mine was not supposed to be. I will call today and speak with a manager about the pricing as I believe we were overcharged. We shall not return for any dinners in the future as the Arrowhead Grill is very close to our home and eating there is always a delight. You’re first mistake was “instructing” your wife. I bet she’s a big girl and you could’ve discussed payment method privately before the check came. I don’t think the establishment is to blame here at least not entirely. I too frequent high end restaurants with my wife and have found that they go out of their way to make sure you get what you want; menu or not but that being said it must be clearly communicated to your server (Aubrey is likely a waitress not a waiter). If a dish isn’t prepared to your liking you ask for it to be done again. You cannot expect anything to be done if you didn’t ask. Um…did we read the same posting? How was it a mistake for him to ask his wife to use the American Express card? When I go out with the parents, my dad always tells my mom to use the same kind of card too so they can get more points. And you DO realize that the man is talking about TWO DIFFERENT occasions when he frequented RC steakhouse, yes?! The reading comprehension level on sites like these never ceases to amaze me. And HE did complain about the onion rings, and “nothing was done” by waiter and manager. In regards to the waitress on his most recent visit, I think there was just a misunderstanding. It’s more than likely that he ordered something he believed would be less expensive, but seeing how it was off the menu, it is more than likely that the price was not a mistake. If I was the waitress, I would have confirmed the price with the customer since it was “off menu” before I put down the order and served the entree/salad to him. However, he is more than likely not going to get any kind of refund because it was his duty to practice due diligence by “checking” over the bill before signing it. Anyway, I don’t see any complaints about food or service that would serve as any big red flags. I plan to give the place a try when it’s my fiance’s b-day next month. since the person used AMEX at least my AMEX has certificates that I can get with my points. Will be going to RC soon and I plan to get $200.00 worth of cert. should cover MOST of dinner then I’ll put the rest on AMEX. Soooooo simple! !